This is not a sports history course, or a how-to-be-a-surfer course. 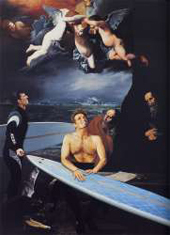 Rather, we inquire into representations of surfing, and, by extension, other “board sports.” Our explorations will include art and design (Carson), aging studies (“Surfing for Life”), disabilities (“Ano Natsu Ichiban Shizukana Umi”), history (Twain, Earhart, Cook), breast-cancer research (“Heart of the Sea”), race (“Black Masculinity and ‘Blue Crush’”), class (“Dogtown and Z-Boys” and “Endless Summer”) and gender (Gerhardt; Messner; Craig). Visual, Textual, and Contextual Analysis: How do people talk about, narrate, represent, and visualize the experience of surfing? How do academic and scholarly tools help us understand those experiences in ways that are different than popular representations? Gender & Language: Is surfing a masculine activity? Is the intersection of competition and cooperation made visible by particular uses of language – and are those uses different between men and women? Culture: Why are surfing, snowboarding, and skateboarding such popular activities? Who participates in those activities, and who does not? Are these activities markers of subcultures? Political Economy: Who controls the companies that design and produce surfboards, skateboards, and snowboards? Who controls, produces, and markets “board-sport” related music and fashion? How is that control exercised? Environment: Is riding a board on cement, water, or snow a natural activity? What do surfers, skateboarders, and snowboarders “leave behind”?